If you want it on a pop, just insert a lolly stick in the chocolate trufle and freeze it together. Follow the same instructions as the cupcake. Colorful Fruit: A great way to review colors with little grads! Stack a skewer with fruit in order of color and have the kids say the color out load as they eat them. 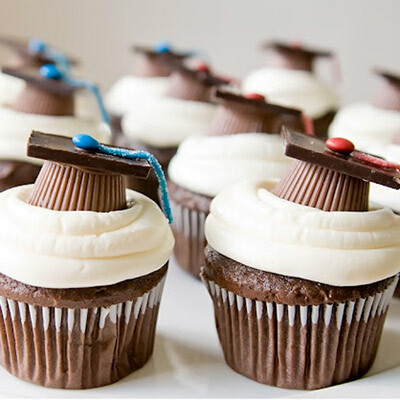 Diploma Roll Cake: Mini roll cakes can look just like little diplomas when tied with a red string. Add these to your table for a snack or delicious dessert. What can be better than an ABC themed grad party? 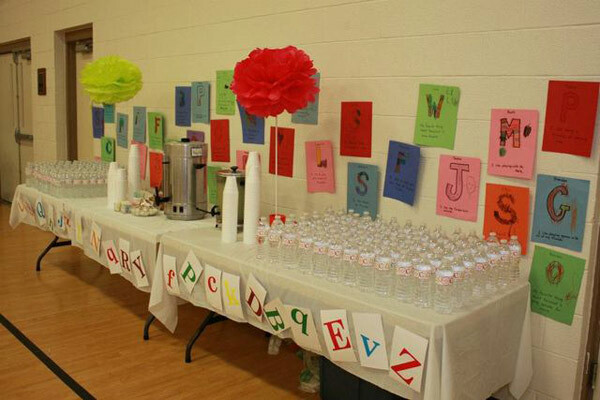 Give the kids some colored paper and let them create the decor for their party! Each child should draw the first letter of their name on the paper and decorate it. Then hang those artworks in alphabetical order along the wall. Get creative with the meal! A great idea would be to have different plates of foods that start with different letters. If you look at the pictures on the right, we have a plate of apples. We wrote "A is for Apple" so the children can connect the two. In the next image, we put out some yummy bite-sized appetizers and wrote "B is for Bite." You can do this for every letter and line the table with the entire alphabet! The kids will have a blast going from table to table checking out which foods match which letters. No need to do the whole alphabet if it is too much. Stick with A-F and it'll be just as fun! Hang-A-Hat: Decorate the walls with this fun hanging idea! All you have to do is cut sqaures out of black cardstock and punch a small hole in the center. Slip a white tassle through and you've got a grad hat! Hang them with clothespins all along a string or rope. The Age Collage: Celebrate the grad's age with this adorable memory collage. Trace his age (number) on an oak tag and cut it out. Gather pictures of him from when he was born up until his current age. Collage the pictures on the big cut-out number and display it at the party. You little grad guy will love to see how much he grew up! Pin-the-Grad-Hat: Twist around the world's classsic party game of pin the tail on the donkey! Get into the crafting mode and construct a child on an oak tag. Cut some grad hats and have the children line with their eyes blinfolded. Whoever gets the hat closest to the head wins!